A getaway to KL is always a good idea. The journey there is quick, halal food is plentiful, and there are tons of activities to do. And when it comes to KL, it’s hard to resist stopping by one of the many malls available to go for a meal or a spot of shopping. So here’s an idea for your next trip: why not stay at a hotel that’s connected to a mall? Over the years, as more malls have opened in KL, so have great hotels and accommodations located right next door and even connected directly. And it makes perfect sense – it’s pleasurably convenient to pop out of your room and have a mall right at your doorstep to dine, browse, and shop, as you wish 😉 So with that in mind, here are 8 great hotels that are connected to KL’s top shopping malls for that all-in-one getaway! One World has long been a favourite for many a weekend getaway, and it’s no mystery why. The hotel is connected directly to the massive 1 Utama Shopping Centre that has about anything you could want in a mall (and more!). And it’s worth mentioning – booking a stay at the hotel come includes breakfast at the hotel’s halal-certified main restaurant Cinnamon Coffee House (located at the Concourse level). From personal experience, I can report that the breakfast buffet is amazing 😍 With the buffet ranging from local fare to Japanese, Chinese and continental offerings, it’s something I look forward to every time I stay there! As mentioned, the hotel is connected directly to 1 Utama via a passage located at the lobby. In addition to having just about every shop you could ever want, the mall also has unique attractions such as an indoor skydiving centre and a flowriding venue. Fancy a luxurious stay right beside the iconic Petronas Twin Towers? Well at the Mandarin Oriental Kuala Lumpur, you can! The hotel is connected to the Suria KLCC shopping centre, located at the based of this national landmark. 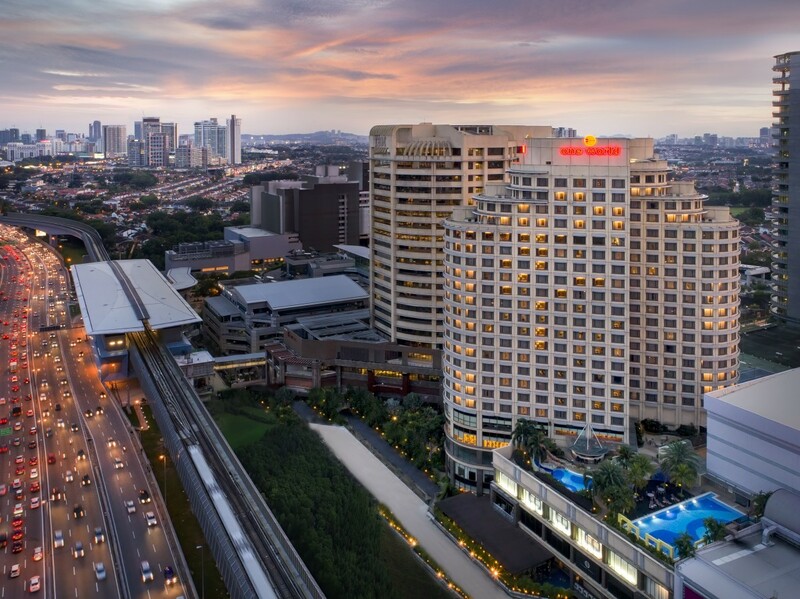 The hotel is right next door to Suria KLCC and is connected via a covered walkway (to get there, head out the main entrance, head to the right and walk along a corridor until you see the entrance to Suria KLCC, which will be on your left. The entrance is right by Aseana Cafe Bar). This five-star luxury hotel offers rooms with some of the best views in the city – you can choose rooms with a city view or a park view (as the hotel overlooks the KLCC park, though do note that heavy construction is currently on-going within the vicinity). For a slight increase in price, you can even opt for rooms that have a view of the Twin Towers! Suria KLCC’s store directory reads like a dream: it has numerous stores ranging from luxury brand boutiques to retail favourites such as Uniqlo and Zara, and of course, plenty of places to eat (including two food courts!). And there’s plenty to do as well – you can sit at the outdoor fountain area to people watch, catch a movie at the cinema, or go see some amazing views of KL from the Sky Bridge of the Twin Towers! #HHWT Tip: Don’t forget to also check out Avenue K, another mall located right across the street from Suria KLCC (via Jalan Ampang), which you can also access via the underground connection to the KLCC LRT station. If you’re looking for a getaway that’s not right in town and would prefer something located in a quieter area, you can’t go wrong with Le Meridien Putrajaya! This hotel, located about 35 km away from KL city centre, is connected to one of the largest malls to have opened recently, IOI City Mall. This sleek and modern hotel has 353 rooms that will provide a wonderfully comfortable place to stay during your getaway 😊 Besides having access to IOI City Mall, the hotel sits opposite the Palm Garden Golf Resort and a 15-minute drive from the Putrajaya (Malaysia’s administrative centre) which houses amazing architecture and national landmarks. But we wouldn’t blame you if you didn’t venture far from the hotel and the mall, simply because it has everything you would need for a leisurely getaway! In addition to countless stores, the mall has an Olympic-sized skating rink, a cinema, a bowling alley, and a 70,000 sq. ft. adventure park. The mall is also known for having plenty of places to eat, so you’ll be spoilt for choice on that front. Number 4 on our list is Aloft Kuala Lumpur Sentral, located at the hub of KL’s transport system and connected to Nu Sentral Mall. This trendy hotel (which is part of the Marriott group of hotels) is as accessible as they come – guests who fly in via KLIA/KLIA2 can take the KLIA Express rail link straight to KL Sentral, from which the hotel is connected to directly! As mentioned the hotel is connected directly not only to KL Sentral, but also Nu Sentral Mall. While the mall may not be big as some of the others featured on this list, the stores there will have everything you need, including departmental store Parkson as the anchor tenant, as well as plenty of food choices! Plus, with the hotel’s location at KL Sentral, you are just a train ride away from anywhere you’d want to go! #HHWT Tip: KL Sentral acts as a transport hub where different transport rails (including the Kelana Jaya LRT, KTM Komuter and KL Monorail lines) converge. The LRT and the KL Monorail are usual modes of transport you can use to get to many of KL’s tourist attractions. Use the MyRapid site to help plan your journey and get further info how to travel using the rail lines! The Sunway City area has become a must-visit for many regular visitors to Malaysia. This bustling township’s hub arguably lies with the Sunway Pyramid, a large shopping centre which boasts a vast array retail and F&B outlets, and is located next to to popular theme park Sunway Lagoon. The three hotels collectively offer accommodations that run the gamut from normal hotel rooms, to suites, and even private pool villas nestled within lush greenery 😮 You’re bound to find something that appeals to your needs. Sunway Pyramid is the retail heart of Sunway City and packs a punch in terms of shopping and F&B offerings. With over 1,000 stores available, it’s a shopaholic’s haven. It also offers a bunch of family-friendly activities including a bowling alley, an ice-skating rink, an archery range, and a laser-tag centre. Contact no. : +60 3 7492 8000 (enquiries for all three hotels can be done through this number). Mid-Valley Megamall has built a reputation for being one of the biggest malls in Malaysia. And with the opening of the adjacent luxury retail outlet The Gardens Mall, it fully became a shopping paradise. Since then, the Mid Valley City has developed into fully-fledged mixed development with connecting offices, residential towers, and hotels, one of them being The Gardens Hotel! The Gardens Hotel (the hotel wing of the property) offers 448 rooms, while The Gardens Residences (the serviced residences wing) offers 199 units. The serviced residences come with a fully-equipped kitchen, and common laundry areas (with washing and dryer machines) available on alternate floors. The Gardens Hotel & Residences is connected directly to The Gardens Mall via a passage located in the lobby. This six-level shopping mall is chock-full of stores leaning towards upscale and luxury brands, as well as two department stores (Isetan and Robinsons). From The Gardens Mall, you’ll be able to stroll over to the adjoining Mid Valley Megamall (via ground-level cross-walk by the Boulevard Entrance or the two link bridges located on the 1st and 2nd floors. If The Gardens Mall wasn’t already enough, you’ll be able to have Mid Valley Megamall at your hotel doorstep 😁 This huge shopping centre will be sure to more than adequately fill your getaway with plenty to browse, shop and dine! When it comes to shopping in KL, it’s hard not to mention Bukit Bintang. The brightly-lit streets of Bintang Walk have become known for being KL’s shopping and entertainment area. With that said, staying at a hotel in this popular area would be ideal for being at the heart of the hustle-and-bustle of the city. #HHWT Tip: If you’re a fan of the massively popular dUCK brand (with its range of scarves, cosmetics and stationary), check out its brick-and-mortar store (the first it ever opened) located at Level 6! The other hotel within the Bintang Walk area to make our list is the Grand Millennium Kuala Lumpur. This hotel is technically not connected to a shopping mall, but given that it’s located right in the middle of Bintang Walk and sits right across from the mall Fahrenheit 88 while also being a stone’s throw away from other major malls such as Pavilion and Lot 10, we had to include it in our list! The hotel is a slightly cheaper alternative to JW Marriott while still offering the same accessibility to Bintang Walk. Located right across from Fahrenheit88 (a mall with mostly mid-level brands such as Brands Outlet and Uniqlo), it is also within short walking distance from Pavilion, Starhill Gallery, as well as the long-established Lot 10. Choose from one of the spacious 468 guest rooms (including 16 suites) that will provide a comfortable stay right in the heart of the city. So there you have it: eight awesome hotels connected to some of the best shopping malls KL has to offer. With access to countless options to dine, shop and play at, you’ll have the most convenient and leisurely getaway to KL yet!